In the not so distant past, the tech transfer office’s role was distinct and well defined: move disclosures through the pipeline to either licensing, start-up formation or to the storage shelf and obtain appropriate patent protection. Of course there’s so much more to it, but the broad outline was clear, with well marked borders. 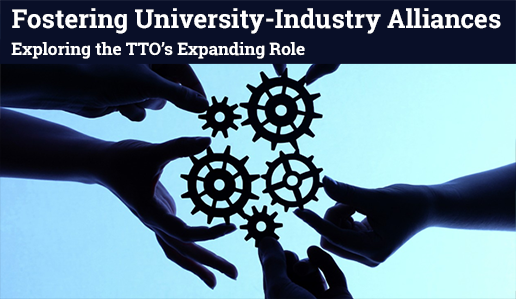 But as more and more universities recognize the valuable linkages between the “old” role played by TTOs and the industry partners that have become vital sources of research funding, that role is expanding. Tech transfer execs that have embraced this broader vision are finding it offers both opportunities for professional growth as well as a huge trove of opportunities for the university research enterprise — funding opportunities, research partnerships, and regional business relationships. PLUS: Hear the recording of the original live Q&A session! As Director of Strategic Licensing & Outreach Programs for the Office of Technology Commercialization (OTC) at The University of Texas at Austin, Mr. Jain helps increase research expenditures and faculty engagement with commercialization by leveraging UT’s intellectual assets, by fostering strategic partnerships, and by creating targeted outreach programs. He also focuses on commercializing UT’s software and copyrightable intellectual property (IP). Mr. Jain specializes in commercially assessing and valuating technologies, guiding investments in patent prosecution, developing commercialization strategies, marketing to prospective licensees, assisting in the formation of startups, and negotiating complex IP-based collaborative agreements to monetize IP. Joy oversees and manages technology transfer activities and corporate relations. He is actively involved in managing intellectual property, assisting in establishing start-up and spin-off companies and bringing forth university-industry collaborations and partnerships. He is an NIH-SBIR/STTR reviewer and has more than twelve years of experience in the field of business development in a career that has produced highly regarded commercialization strategies and outreach practices of novel technologies in the biotechnology, agriculture and biomedical sectors. He is a Registered Technology Transferred Professional, a USPTO Registered Patent Agent, and a Howard Bremer Scholar.